Although Americans are stereotypically known for having gotten fat and lazy, in reality we are among the hardest workers in the world. No three-hour siestas or one-month vacation times for us, oh no--in fact, many Americans find themselves working overtime. The stresses of many long hours, week after week, spent toiling at a desk or in front of a counter take a huge toll; when we come home at night it's usually the most any of us can do to collapse on the couch in exhaustion. Although we all wish we had our own personal masseuse to gently caress away the stresses of the workday, this is an expensive luxury seemingly out of reach to most of us. The advent of the massage chair in the 1950s brought the idea of a piece of equipment that could replicate the experience right into one's home, but these early models were clunky and mechanical; while they offered rudimentary vibration, they felt mechanical and it seemed like there could be no replacement for the warmth of a real human touch. 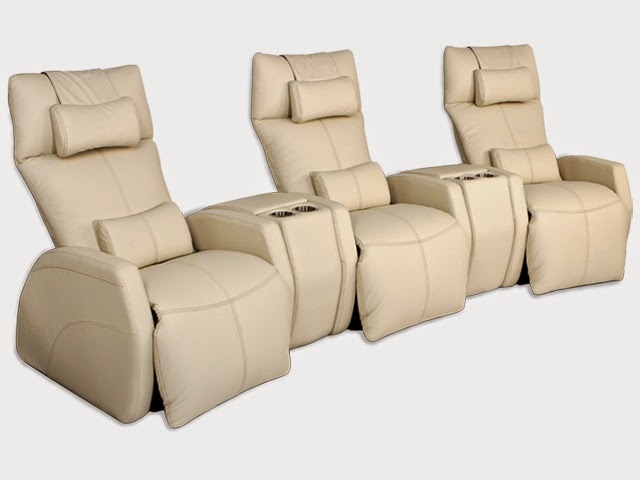 Over the years, however, the technology has been continually refined, to where the highest-end massage chairs offer a far more realistic experience than ever before. With these new developments in mind, Seatcraft is pleased to announce the arrival of the Spectrum, one of the most sophisticated and effective massage chairs available on the market today. The Spectrum combines an array of massage options for one of the coziest and most addictive experiences that a massage chair can offer. The seat itself is fashioned from bonded leather, which is designed to replicate the look, texture, and feel of top grain leather with an easy maintenance and affordability. Solid black, brown, or ivory color options will fit just about any decor option, and help make the Spectrum the centerpiece of any room. In addition, a 46" seat back and 23.5" seating surface will accommodate larger sizes. As you sit, an eight-button control panel sits to the right, from which you can customize your massage. A power button at the center turns the device on, from which directly underneath lies the "Zero G" button. This button will slowly tilt the chair backwards, to the coveted zero-gravity position that allows you to find your true center of gravity. This position imparts a supreme sense of weightlessness, as if floating in perfect balance--an optimal position for a massage. Two upper side buttons on the control panel additionally control the recline of the seat, so that you can stay in any desired position, from Zero G to fully upright! Two lower side buttons on the control panel controls the seat's luxurious chaiselounger, which can be extended to provide a full buttress of pampered support for the legs and feet. Being able to control the position of the lower body as well as the upper body gives one a complete range of options. Finally, massage buttons on the panel will gently vibrate your neck, shoulders, back, lower back, and bottom with a smooth precision. Miss the warmth of a human touch? A button on the left of the panel controls a seat heating function, which when combined with the vibrational massage, creates a sensational effect that will have you purring like a cat in no time. The combination of these elements works together to create an extraordinary seating experience that is part lounge, part massage, and part contemplative Zen. As if that weren't enough, the Spectrum massage chair is equipped with neck and back pillows that create a soft, supportive space to further melt away stress and muscle strain. 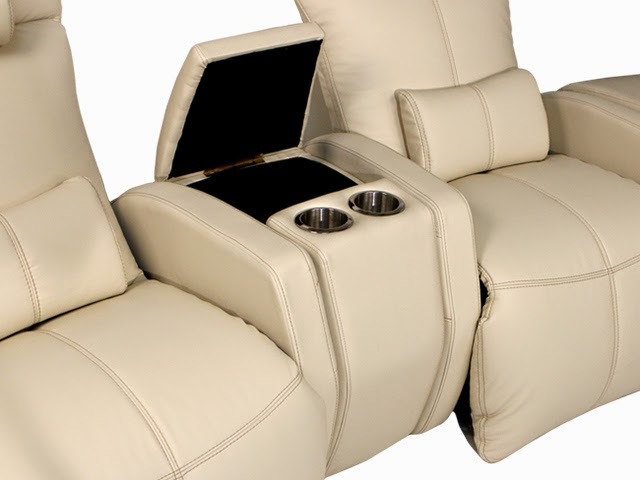 An optional polyurethane storage console features plenty of space for the placement of essential items, along with two cup holders for the convenient placing of drinks within arm's reach. 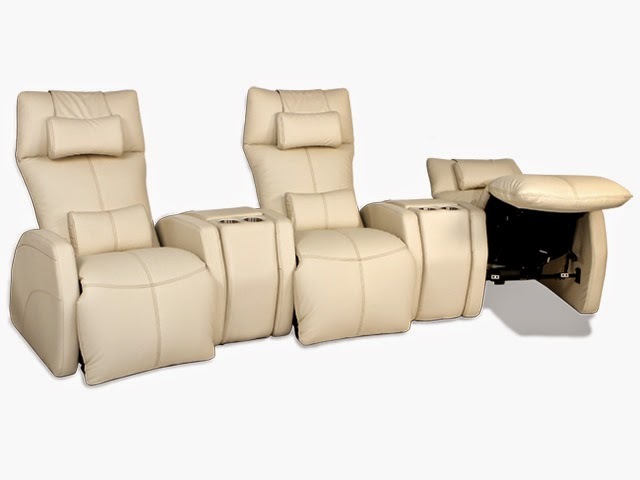 Turn your massage chair into a home theater seat, as you lay back to watch your favorite films with drink and remote in hand! Watch as your friends and family clamor to experience the ethereal touch that only the Spectrum brings to the world of after-hours relaxation.